Previously unknown until a few years ago, street photographer, Vivian Maier (1926-2009), is almost in danger of over-exposure. Having never exhibited a picture during her lifetime, over the past few years Maier has been the subject of non-stop shows in many parts of the world. Last month her work was shown for the first time in Australia at Melbourne’s Centre for Contemporary Photography. 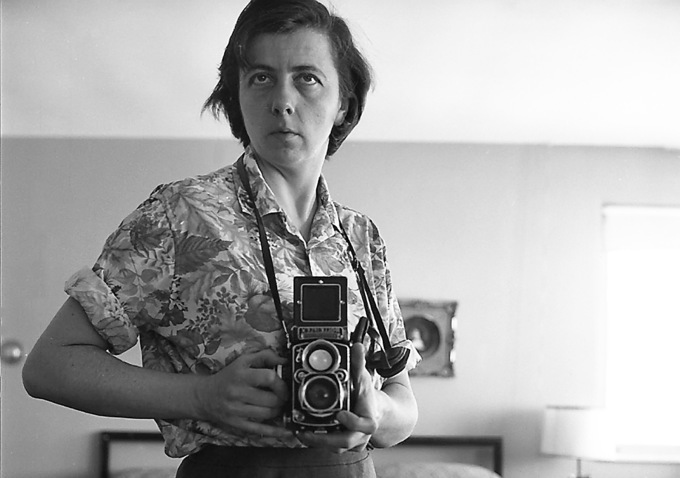 Finding Vivian Maier reveals a woman with an obsessive need for privacy who had no qualms about using a camera to invade the privacy of others. Her passion was for the hunt not the catch, because most of her images were consigned to a monumental archive and never looked at again. At the time of her death she left 150,000 negatives. We owe the discovery of Vivian Maier to John Maloof, a young Chicago historian who has directed this conventional but fascinating documentary in collaboration with Charlie Siskel. In 2007 Maloof bought a box of old negatives at an auction, hoping to find some original visuals for a book he was writing on his neighbourhood, Portage Park. It took him two years to get around to developing the film, but the results were so surprising he was prompted to dig through the material to discover the identity of the photographer. Maloof came up with the name “Vivian Maier” on an envelope, but could find no references on the web. Eventually he located an obituary that revealed Maier had only just died. He followed the trail to a storage unit filled with her possessions and papers. It turned out that Maier had spent her life working as a nanny for a succession of families. This gave Maloof his entrée into the world of a strange, secretive woman. Much of this documentary is devoted to interviews with Maier’s former employers or those who were once in her care. Other interviewees are mostly artworld insiders, or well-known photographers such as Mary Ellen Mark and Joel Meyerowitz, who express their appreciation of Maier’s work. Two points are beyond dispute: Maier had an incredible eye for a photo, and was one of the weirdest human beings anyone had ever met. Many of the details of Maier’s life may never be known, but she was born in New York and would spend much of her childhood in rural France. In 1951, at the age of 25, she returned to New York, where she survived on menial jobs. From 1956-1972 she would work as a nanny for two families in Chicago, a routine broken only by a trip around the world in 1959-60, that produced photographs of China, Thailand, the Philippines, the Middle East, India, Europe and other parts of the United States. No-one knows how she financed her travels but it is believed she came into an inheritance. After 1972 Maier’s jobs became more short-term, as her behaviour grew more erratic. One of her employers was the TV personality, Phil Donahue. Maier was tall, opinionated and physically imposing. She wore sensible shoes and was rarely seen in public without her Rolleiflex. She must have been an intimidating presence to the children she looked after, and the people she photographed. As her biography unfolds we begin to see Maier as less of a loveable eccentric and more as a person who suffered from some form of mental illness. She had multiple spellings for her name, and told conflicting stories about her past. Oddly, her guarded nature did not prevent her from taking numerous self-portraits, as if she felt a lingering need to assert her existence. Maier would take her young charges on excursions into the poorer, more dangerous parts of town in search of interesting subject matter. She could be stern and even violent. In later years her habit of hoarding became an obsession. She collected newspapers in ever-growing piles until the floor of her room began to sag. Although most interviewees remember her with fondness, there is an undertone of unease in some of the anecdotes, as the speaker realises how little he or she actually knew about the nanny. Maloof does his best to unravel the mystery, even travelling to France to interview villagers who might have known Maier and her family. It seems, however, that he didn’t search thoroughly enough because Maier’s estate is now the subject of a legal dispute as to who is the rightful heir. If the case continues it will cast doubt on who owns the copyright of the work and put a freeze on exhibitions. It’s ironic that a lawsuit may temporarily restore the privacy and anonymity that Maier craved. Published in the Australian Financial Review, Saturday 15th November, 2014.